Our fridge has never been so stocked full of veggie goodness! Also known as Broad Beans, Field Beans, Tic Beans or Bell Beans. Neither of us had ever tried them and well since we’re not one to let a challenge go by we set out to make a delicious meal out of them. What we came up with was a super simple stir fry type meal and only needed a few extra ingredients. There are many ways to prepare the beans and the peeling of the skin is a debatable issue. Since we’re kind of lazy in the kitchen we opted to leave the skin on and it cooked up real nice. Since then we’ve gone through the entire batch throwing them with a variety of veggies and liking them more and more each time! They are in season right now so grab a bag and get to shuckin! This serves two people so if you are going to be feeding more you’ll want to adjust accordingly. You’ll need to par cook (or cook halfway) your fava beans just to give them a head start. If you try one raw, you’ll notice a little bit of a bitter taste. That will go away as soon as you par cook (or blanch). Also if you want to eat them without the skin par cooking will allow you to remove them much easier. Bring water to a boil in medium sauce pan. Add fava beans and boil for about 2-4 minutes (once the skin begins to separate from bean you’re done). Drain and set off to the side. If you want to go sans skin, let them cool and remove. If you’ve decided to use sausage, remove the casings and cook on medium heat until thoroughly done. Break up the sausage into big(ish) chucks. When done remove from pan but leave the drippings. If there is a lot of drippings save 1/2 for cooking with another day. Add onion, tomato and fava beans to pan and continue to cook on medium until onion is tender. Add back the sausage and combine all together for a few more minutes…. Side Note: When shelling fava beans you might notice the little stem that tends to stay attached to the bean. That comes off pretty easy just by “cracking” or “snapping” off the top. Except the original smothered pork chop recipe had yet to be posted (so many recipes, so little time!). So before we give this little ditty to you let us make one thing clear: This recipe is freaking delicious! We didn’t realize how much we loved the sauce until we took out what we had frozen and put it on something else. If you are so inclined to give this one a shot (and we know you will) let us be the first to tell you: Do Not Throw Away the Left Over Sauce (if there is any). In fact, make extra if you can and freeze it for later use. You’ll see why! The original recipe came from Paleo Comfort Foods and we left a few things out (according to what we had in the pantry). Mix almond flour, garlic powder, salt, pepper, paprika together and pour onto plate or bowl. Dredge pork chops into flour mixture (shake off excess). Keep the flour mixture for later in the recipe. Heat oil in skillet and cook pork chops 3 – 4 minutes per side. Remove from skillet and set aside. 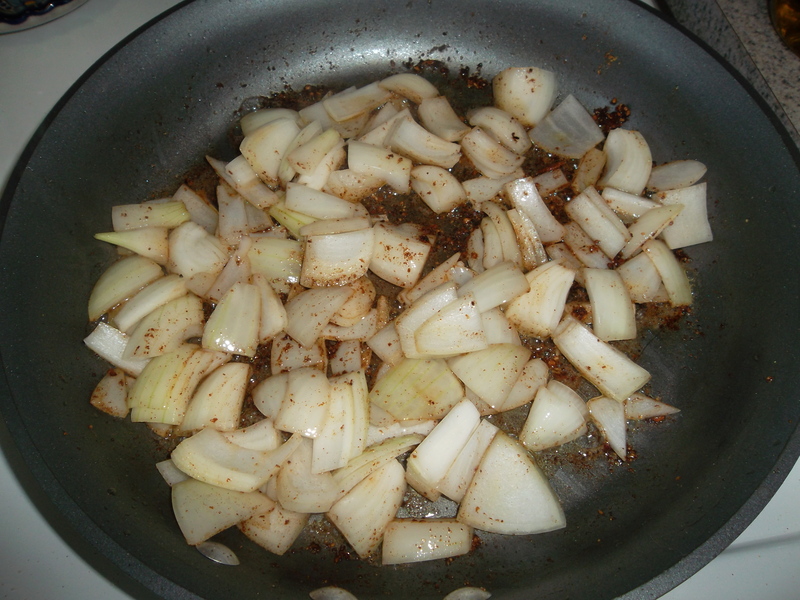 Add Onions and “deglaze” the pan (stir to loosen browned residue). Cook until onions are browned. Sprinkle remaining flour mixture over the onions, add chicken stock and stir until combined well. Allow to simmer for about 5 minutes. Add pork chops back into pan, making sure they are covered with sauce. Allow to simmer for an additional 5 – 7 minutes. When ready you can serve this on just about anything your heart desires. Since we are trying to be as Paleo as possible, we opted to just serve it with sauteed veggies. This bad boy has the fava beans and the peas from this week’s CSA. We also threw in some leeks, onion, sweet pepper and Chinese cabbage and cause we are the eaters of the meat; pork. It was delicious and because the sauce was pre-made weeks before there was hardly any prep time. No need for a recipe on this. Slice the pork and cook thoroughly. Add veggies and saute. When done add sauce and simmer until hot.